Massachusetts Oyster Project: Important New Jersey Oyster Restoration Legislation Could Set Helpful Precedent. Important New Jersey Oyster Restoration Legislation Could Set Helpful Precedent. This article originally appeared in the Asbury Park Press. It can be found by clicking here. The importance of this legislation is that it would show the shifting of the tide toward oyster restoration in yet another State. Massachusetts is only slightly less restrictive than New Jersey. Let us hope it passes. KEYPORT – Could oysters be on the way back to Raritan Bay? An environmental group hopes so, after a bill that would permit research-related commercial shellfish reefs in the bay, as well as some other coastal and inner harbor contaminated waters, was reintroduced this week. The bill would remove a ban the state Department of Environmental Protection placed four years ago on the cultivation of these types of reefs in contaminated waters. A similar bill failed in 2012 to make it out of committee. "We're hoping the bill gains momentum and there is no pushback from the DEP," said Sandra Meola a spokesperson for NY/NJ Baykeepers, a Keyport-based nonprofit pursuing the recultivation of the reefs. According to the DEP, the ban was issued because of the federal Food and Drug Administration's strict requirements about patrolling and monitoring the shellfish reefs. "Back in 2010, the FDA had threatened federal sanctions or a shutdown of the shellfish industry in New Jersey because one group wasn't doing the required monitoring of these beds in a contaminated water body," said Bob Considine, a spokesperson for the DEP. Considine said the lack of oversight on the reefs could lead to the risk of poaching, which could jeopardize the food supply with oysters unfit for human consumption. He said the DEP is reviewing the bills but they continue to have the same concerns today. "We recognize the importance of this type of research in relation to the health of contaminated waterways. But not if it's going to put people's health at risk," Considine said. The NY/NJ Baykeepers believes oysters can help restore water quality in the Hudson-Raritan Estuary, which they said is the most urban estuary on Earth. "Our work has always focused on the unique challenges of an urban estuary," said Meredith Comi, NY/NJ Baykeeper's oyster restoration program director. "Basic scientific questions regarding how oysters improve the functioning of an urban estuary must be answered. Lifting the ban on shellfish research will allow this vital data to be collected and used to develop restoration practices that are appropriate to the unique conditions of the NY/NJ Harbor." In 2010, when the ban was issued, the NY/NJ Baykeepers had to remove their reef in Keyport Harbor in Raritan Bay, which they had been cultivating for nearly a decade. "That was years of research and living oysters put into the bed of a truck and disposed of," Meola said. The waters of Keyport Harbor in Raritan Bay are prohibited from shellfish harvest and cultivation, along with other waters in the bay, according to the DEP. In 2011, NY/NJ Baykeepers began cultivating an oyster reef at Navy Earle pier in Middletown, with permission from the federal government. 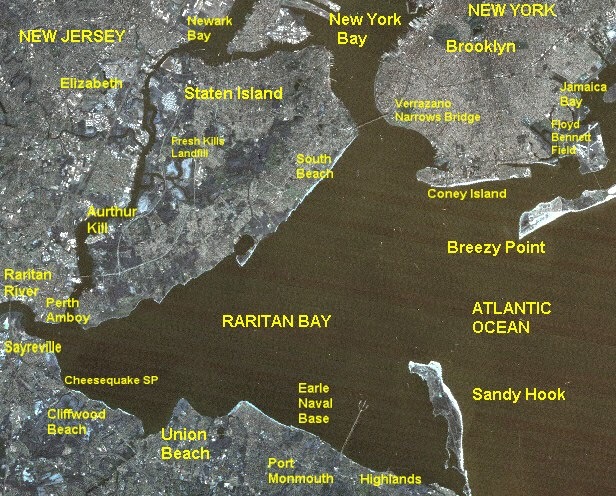 It is their only research-related reef in Raritan Bay. "We all want to protect and maintain the health of our waterways," Assemblyman Carmelo G. Garcia (D-Hudson) said. "Oysters do this naturally by filtering the water and removing nitrogen compounds. They also serve as barriers to prevent beach and shoreline erosion and provide refuge and habitat for fish and other sea life." Garcia, along with Assemblyman John McKeon (D-Morris) and Senator Gerald Cardinale (R-Bergen), are primary sponsors of the bill.